When it comes to hair loss, there are four primary ingredients with great clinical studies to back their efficiency: propecia, minoxidil, biotin and ketoconazole. Yes, you read that right. Ketoconazole — a popular anti-fungal treatment — is actually one of the big four hair loss topical treatments. Is it any wonder why people started flocking to 2% Nizoral hair loss shampoo for hair thinning relief? With a whopping 2% concentration of ketoconazole, 2% Nizoral hair loss shampoo became a superstar and started generating a lot of buzz. Where most hair loss treatments can be expensive, complicated, and hard to find, 2% Nizoral hair loss shampoo was the easily accessible and useful topical solution that gave hair loss sufferers hope. That being said — it is time to forget about 2% ketoconazole Nizoral. 2% Nizoral is now available via prescription only so it’s nearly impossible for you to get it without prescription from your doctor. Sure, you might find it in Walmart if you live in Canada or somewhere in Europe or Australia, but otherwise you’re out of luck trying to find it elsewhere. But don’t worry — there’s no reason to give up on ketoconazole! There’s no doubt that 2% Nizoral is more effective, but studies show that the 1% version can also slow down hair loss. 1% Nizoral hair loss shampoo is also more easily accessible, so you can get started on combatting hair fall without delay. Besides, there are now a great number of shampoos on the market that contain ketoconazole, plus other active hair regrowth ingredients. We’ll help you figure out what ketoconazole shampoo can do for you and make sure you get the right ketoconazole shampoo for your needs. Does ketoconazole have any side effects? 2 Does Ketoconazole stop hair loss? 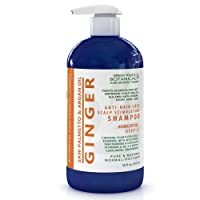 4 What are the best Ketoconazole shampoo for hair loss available over the counter? Ever had to deal with dandruff at some point in your life? Then chances are you’re already quite familiar with ketoconazole. Contrary to popular belief, this isn’t just your run of the mill shampoo ingredient. Ketoconazole is a drug — belonging to the azole anti-fungal class. As the name suggests, its primary strength lies in straight up shutting down the growth and development of fungi on the body. Ketoconazole is commonly used to treat a wide variety of fungal infections like athlete’s foot, seborrheic dermatitis, ringworm, and — of course — good old dandruff. Take note: it’s an actual drug, though, and therefore should not be taken lightly. In fact, a doctor’s prescription is required if you want to take ketoconazole orally. You’ll have to provide your medical history as an extra precaution, too. As a topical treatment, ketoconazole is most popularly known as an ingredient contained in shampoo. However, it’s actually available in a wide variety of options like cream, gel, solution, and even foam. Though using ketoconazole as a topical treatment usually won’t require a doctor’s prescription, you’ll still have to get special instructions to make sure you’re using it right. See, different skin conditions require different approaches. A cream is more suited for treating ringworm, while the foam type of ketoconazole works best with seborrheic dermatitis. In fact, a 2005 study published by the Journal of Dermatology found that topically applied ketoconazole shampoo can stimulate hair growth. It’s an efficient treatment against androgenetic alopecia, better known as male pattern hair loss or pattern baldness. Patients suffering from androgenetic alopecia are genetically more sensitive to the effects of dihydrotestosterone, or DHT. This androgen shrinks the hair follicles until they’re completely miniaturized and can no longer produce hair, hence the resulting baldness. The good news is that ketoconazole is a known DHT-blocker – it disrupts the effects of this androgen on the follicles and prevents further hair loss. It works best when used in conjunction with finasteride — an ingredient that stops the enzyme 5-alpha-reductase from converting regular testosterone into DHT. Any DHT that gets past finasteride, ketoconazole can block. The combination is excellent for stopping hair loss in its tracks. Ketoconazole is both anti-fungal and anti-sebum, making it an excellent scalp treatment. By eliminating excess sebum, ketoconazole can unclog the hair follicles and allow hair to grow naturally and without impediment. As an anti-fungal fighter, ketoconazole works to maintain a healthy scalp environment that encourages the natural hair growth cycle. Are you ready to start using ketoconazole to combat hair loss? Hold your horses. Most of the side effects associated with the drug occur when it is taken orally, but topical use requires some care, too. It goes without saying: stop using ketoconazole immediately if you get any signs of an allergic reaction like hives, facial swelling, and difficulty breathing. But even without an allergic reaction, people can still react poorly to ketoconazole. Monitor the affected area for itchiness, swelling, redness, or a burning sensation. If applying ketoconazole topically results in any of the above, it’s best to call your doctor right away! That being said, minimal side effects are to be expected with ketoconazole use, especially when in shampoo form. Nizoral users, for example, have noticed some unexpected changes in hair texture. People have reported an increase in both oiliness and dryness, as well as some hair color discoloration. The scalp isn’t safe, either. Users of ketoconazole shampoos noticed some dryness and irritation on the scalp, with some itchiness thrown in. Eczema and pimple breakouts can also occur. In rare cases, use of these shampoos can lead to contact dermatitis — a skin inflammation that can lead to an increase in hair loss. Finally, pregnant women may want to steer clear of ketoconazole, or at least consult a doctor before trying it out. Though the data is currently insufficient, the US Food and Drug Administration (USFDA) has declared ketoconazole Pregnancy Category C, which means it is potentially harmful to the baby. Now you already know what Ketoconazole is and how it could treat your hair loss. So what is the best ketoconazole shampoo for hair loss? Read on! We have some recommendations for you. Congratulation! You have made 35% of the article. Don’t miss the most important part! Keep reading! What are the best Ketoconazole shampoo for hair loss available over the counter? To be fair, many of these side effects are negligible when compared to the benefits of ketoconazole, which is why doctors still prescribe it to patients all the time. In fact, a shampoo with less than 2% of ketoconazole can offer the same benefits minus the potential irritation. Nizoral hair loss shampoo 1% of ketoconazole is the perfect example to treat hair loss. Unlike its 2% counterpart, Nizoral Hair Loss Shampoo with 1% Ketoconazole is available over the counter and is easily accessible. It has all the benefits that the 2% has, but without the harsh effects and without requiring a doctor’s prescription to purchase. 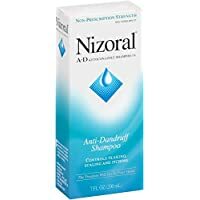 Officially designed to fight dandruff and scalp infections, Nizoral may have become more popular these days for its off-label use. It just so happened that ketoconazole — an ingredient that fights infections and inflammation — also had the ability to stop hair loss. Pattern baldness (for both men and women) is one of the most common causes of hair loss. It’s genetic, and unlike stress-related hair loss, can be the most difficult type to treat. There are few available options for treating pattern baldness, and one of those options is ketoconazole thanks to its ability to block DHT. People with pattern baldness are genetically more sensitive to DHT, so the hair follicles may suffer miniaturization and lead to hair loss. Nizoral hair growth shampoo became a real, legitimate option once people realized its primary active ingredient is ketoconazole. The downside is that Nizoral hair loss shampoo is a straight up treatment — not just your usual shampoo. Using it daily instead of the recommended two to three times a week can lead to dryness, irritation, and redness. It also does not contain the usual moisturizing ingredients that most drugstore shampoos contain, so 1% Nizoral can cause some hair tangling or leave hair looking flat. There’s also the matter of SLS (Sodium Lauryl Sulfate) — an ingredient that most consumers avoid these days because of it can strip hair dry. Nizoral hair loss shampoo still has SLS in its formulation, which can make some users a bit wary. In any case, the manufacturer recommends using Nizoral shampoo only twice a week, so for the rest of the time it’s a good idea to switch to a more moisturizing shampoo that has biotin or nourishing plant oils. Another option is to add a thickening conditioner or a moisturizing treatment. Using 1% Nizoral as part of a holistic hair restoration treatment is the best way to get great results. Although stopping hair loss isn’t one of the official uses of 1% Nizoral hair loss shampoo, many users have commented on its effects on their hair regrowth efforts. Without even knowing that people do use Nizoral hair growth shampoo, a few users were pleasantly surprised and reported baby hairs growing in the balding areas after a couple weeks of regular use. One user noticed new hair growth after one month of steady use (two to three times per week) after suffering from hair loss caused by scalp dermatitis and PCOS (Polycystic ovary syndrome) for years. Customers also noticed a significant decrease in excessive shedding, so the hair looks fuller and greater in volume. 1% Nizoral hair loss shampoo is also excellent for scalp inflammation, with customers reporting an improvement in the redness and itchiness with just one wash. Some users noted that using Nizoral on consecutive days could leave hair feeling stripped, so spacing out the uses is important. Customers also found better results when using biotin or argan oil shampoos on the days they weren’t using 1% Nizoral, to boost its results. Though some users initially wanted 2% Nizoral shampoo for hair growth, many found the 1% Nizoral the better option as it is easily available over the counter without a prescription. A common complaint for Nizoral users is the SLS in the shampoo, as it can be quite stripping — especially on curly or textured hair. Before you use Nizoral hair loss shampoo, you have to remember that it is — first and foremost — a treatment. It’s not your regular drugstore shampoo, so there’s no need to use it daily. Use it twice a week or every three days. Just make sure to maintain the schedule so your scalp gets regular treatments. Work the shampoo into a rich lather and start massaging into your scalp for at least 60 seconds. Don’t rinse it off just yet! To maximize the use of Nizoral shampoo for hair growth, you want to keep the treatment on your scalp for at least two to three minutes. Rinse thoroughly and repeat. Using a conditioner after is completely optional. Congratulation! You have made more than 70% of the article. You are almost there. Keep going! Hair Surge is all about hair regrowth stimulation — it contains powerful active ingredients that don’t just stop hair loss, but also promote growth. First of these active ingredients is caffeine. It’s an excellent stimulant that is proven to boost the natural growth cycle of hair. Caffeine also extends the anagen (growth) phase of the cycle, allowing hair to grow to its full length. Saw palmetto extract is the second key ingredient in Hair Surge, and it’s a very popular hair loss treatment thanks to its ability to block 5-alpha-reductase. 5-alpha-reductase turns regular testosterone into DHT, which contributes to androgenetic alopecia, so blocking it stops hair loss. The third active ingredient is 0.2% ketoconazole, and it works just like nizoral shampoo for hair growth. 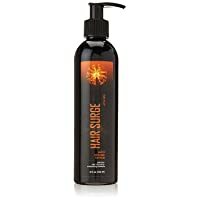 Ultrax Labs recommends using both the Hair Surge shampoo and conditioner at least five times a week, and letting the product sit on the scalp for two minutes per wash before rinsing off. For best results, use Hair Surge shampoo with Ultrax Labs Hair Rush supplements and Hair Solaye conditioner. Where most hair loss shampoos can take some time to show results, it’s remarkable that even the most skeptical customers noticed a significant decrease in hair loss in just three washes. One user took the plunge by using Hair Surge as a last option to treat hair loss before going for a transplant and was pleasantly surprised to see new hairs growing along his hairline. Customers also noticed significantly less breakage and stronger hair with regular use. Hair looks thicker and shinier with regular use, restoring and boosting customers’ confidence. Users with curly hair, however, found Hair Surge a bit drying when not used with a conditioner afterwards. It also requires a minimum of four pumps to get a rich lather, and even then some customers found it difficult to feel fully cleansed with Ultrax Labs Hair Surge. Customers are divided on the fragrance! Some users just love the citrus and mint scent, while others found it a bit overpowering. This hair loss shampoo from Hair Growth Botanical is all organic in its approach. It has saw palmetto, a natural extract that blocks DHT to stop pattern hair loss, as well as a natural stimulant like ginger to boost blood circulation on the scalp. Caffeine, capsaicin, and other vitamins all work to boost the natural growth cycle of hair. Together, these ingredients work to push hair regrowth. Like Nizoral shampoo for hair loss, Hair Growth Botanical also has 1% ketoconazole to block DHT and to cleanse the scalp thoroughly. Ketoconazole unclogs the follicles, removes excess sebum, and prevents product build-up on the scalp. Hair Growth Botanical recommends using their shampoo two to three times a week, with their Step 1 pre-shampoo treatment and their Step 3 conditioner for best results. The most common comment from customers regarding Hair Growth shampoo is “tingly,” likely due to the capsaicin (also known as cayenne) it contains. Users describe the tingly feeling as stimulating, with one user noticing new hair growing near the hairline in just two weeks. Customers also reported a decrease in excessive hair fall in just two washes, with the shedding slowing down to a negligible amount with regular use. Users suffering from stress-related hair loss noticed thicker, shinier, and stronger hair after just one week. The tingly feel can be a matter of debate among users, though. Some thought it was refreshing, while others likened it to Icy Hot and found it a little overwhelming. The scent has also got people divided, with some users quite in love with the natural, organic scent. Others found the rosemary and lemongrass combination a little too powerful. Ketoconazole is a proven ingredient against hair loss, and it definitely is something you should add to your regimen if you want thicker, healthier hair. That being said, 2% Nizoral is no longer available and it’s time to look for an alternative. Studies have shown that though 2% ketoconazole produced more efficient results, a hair loss shampoo with lower concentration is still effective in stopping hair loss. Consider Nizoral hair loss shampoo 1% ketoconazole — it is a perfectly viable option with scientifically proven efficiency. If you’re looking to use a ketoconazole shampoo daily, there are options with less than 1% concentration. These shampoos come with additional ingredients like caffeine and saw palmetto to encourage hair regrowth. Often times, the fight against hair loss can be mired in misinformation and myths. If you want real, tangible results, look into clinically proven efficient ingredients like ketoconazole. For a long time, I have looked for a shampoo that meets my satisfaction. I guess I have found my desire products and I will definitely buy this shampoo for my hair loss solutions. I hope and believe that I don’t have to regret later.